Or the Tin Man according to the film. 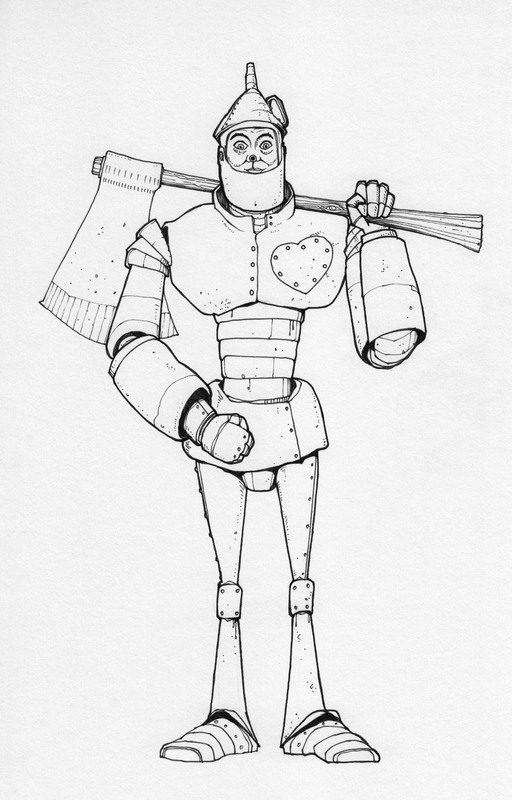 In the books, the Tin Woodman was originally a human called Nick Chopper. He was turned to tin by the Wicked Witch of the East to stop him from marrying his true love. This is my take on the character from the 1939 film, I wanted to keep the face the same as Jack Haley’s, but give the rest a bit of a twist. It’s always awesome to find people adding their own style to their subject matter. Well done! Hi, thanks for your comment, I’m glad you like my stuff. I always drew as a kid, and did so up until I finished art college. For some reason I stopped drawing then, and barely picked up a pencil in twenty years. It’s only in the last couple of years I’ve started to draw again, and only in the last eight months I’ve begun to draw every day. Another one I like, This time I was checking your draws with my daughter (almost 3 years old) and she asked me for a pencil to draw after seeing your draw. Which means she really liked it as well. amazing! I love the stories about OZ and you’re picture is fantastic.